Another S/S 2011 collection? Why not! As you might have guessed, Colour Pop! is all about, um, well, colour. The catwalks were awash with vibrant colour for S/S 11. We loved Jil Sander's colour-blocking (you can view the show here). We've followed suit with our accessory range devoted to the bright and beautiful. Think paintbox colours, summer patterns and florals (in lots of varieties). 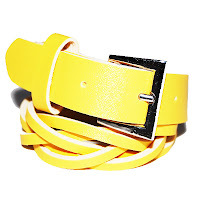 This Bright Yellow Weave Strap Bracelet, £10, is a brilliant solution to add a flash of colour to your outfit. Making a huge statement, not only with its colour but also with the weave and buckle wrap design, this bracelet is not for the shy. These Pink & Gold Triangle Earrings, £7, are gorgeous! We love how great pink and gold looks together and can't help thinking how amazing they would look with a golden tan. They have such a 70s vibe, and the bright pink shimmer is so eye-catching. You might like to shield your eyes from the next piece. 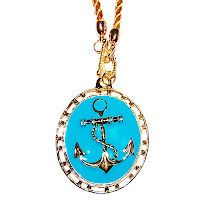 This Anchors Away Necklace, £14, in a dazzling turquoise, is just the tonic to add some vibrancy to your outfit. Its gold twisted fabric chain and toggle design complicate the necklace further to make it even more outlandish! Our fave piece from the collection is this Butterfly Garden Stack Ring, £13. We are totally feeling the love for stack rings at the moment. A statement piece in their own right, you only need to wear one, for maximum impact. This one particularly caught our eye because of the fusion of neon brights and primary colours. 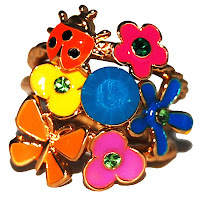 A 3d ring, the ladybird and butterfly look so life-like. We can't stop staring at it!